Although finished gourd baskets may resemble pottery, gourds began life as plants, and have been used in many cultures for thousands of years. In fact, they were one of the first plants to have been cultivated throughout the world. It is believed that gourds were the first vessels, predating baskets. Gourd vessels are indigenous to every culture, except very cold regions. They were used to store wet and dry goods, to haul items, and as cooking and eating utensils. Historically, gourds have also been used as musical instruments. Rattles, drums, horns, whistles and flutes were all constructed from dried gourds. They were (and still are) even made into elaborate stringed instruments and thumb pianos. 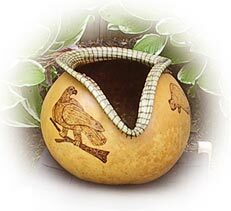 Some North American Natives believed that the gourd was the resting place for the Gods and Spirits. This is reflected in the Huichol prayer bowls. Another belief is that the gourd brought good spirits to the earth and captured the bad spirits. It is considered good luck by many Chinese people to have a gourd in your home. 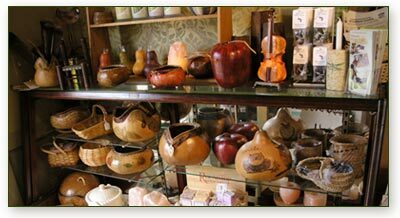 Pinelands offers many beautiful examples of gourd baskets, perfect for many uses today. Come in and see our large selection for yourself — once you do, you will discover that every gourd baskets tells a story of its own!